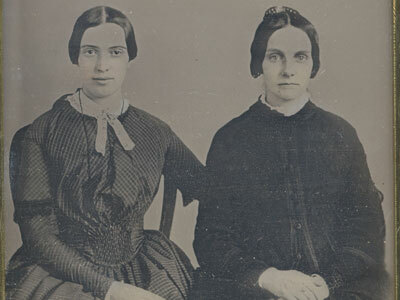 Is This Emily Dickinson and Her Female Lover? Researchers believe a newly-discovered photo may show poet Emily Dickinson with Kate Scott Turner, a woman rumored to have been the poet's lover. Researchers believe a newly-discovered photo may show poet Emily Dickinson with Kate Scott Turner, a woman rumored to have been the poet's lover, reports International Business Times. The daguerreotype photograph was thought to have been taken around 1859, when the iconic "Belle of Amherst" poet was 30 years old. It was purchased by an anonymous collector in 1995 and taken to Amherst College for analysis. While there hasn't been official confirmation that the image is indeed the two women, Mike Kelly, head of the archive and special collections department at Amherst College, tells the Associate Press he's certain that the subjects in the daguerreotype are Dickinson and Turner. If the photo is Dickinson, it is only the second of her known to exist. While there no concrete evidence that Dickinson, one of the 19th century's most revered poets, was a lesbian, and she is believed to have been in love with several men over time, some Dickinson scholars believe she may have been bisexual. Some point to an ambiguous letter, written in 1852 shortly before she became a recluse, sent to her sister-in-law Susan Gilbert. A book published during the 1950s was the first to suggest that Dickinson might have been lesbian or bisexual and the new photo, if it is indeed the poet, contradicts a misperception that Dickinson never left her house.